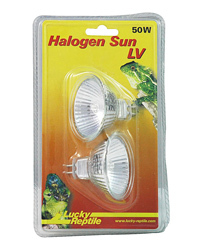 The Lucky Reptile Halogen Sun Low Voltage Lights are small but powerful, emitting ample light and heat via reflectors. This makes these bulbs better for reptiles than standard low voltage lamps found in hardware stores, as the light and heat is sent forward where it is useful for the reptile instead of back. Lucky Reptile Halogen Sun LV lights have a G5.3 socket and will fit in the Lucky Reptile Jungle Lamp and others which suit MR16 halogen lamps.